We perused some images from the show to see for ourselves what she meant! After checking out the looks, we realized that many of them can be duplicated using SUMARIS jewelry - and for a fraction of the price. Check out this model wearing heavy statement earrings featuring metal discs and beads. Capture a similar look with our CONVOLUTIONS earrings, which feature vintage plastic discs, vintage Czech rhinestone buttons, and Czech crystals. These earrings are a whopping five inches long, so wearing them will make just as bold a statement as the earrings on the model. Wow! Did you see these Saint Laurent triangular earrings? They look almost like tribal jewelry found in The Metropolitan Museum of Art. The beaded metal detail is simply stunning, and the dangling charm is a special touch. Lucky for you, you can recreate a similar silhouette on your earlobes with SUMARIS ICE SPEAR earrings. We suspect their smaller size makes them even more comfortable for everyday wear. Made with eye-catching Swarovski components, these 2.75” long earrings feature the same trendy triangle shape and multi-piece construction. Looking for more of a dangling chandelier look? 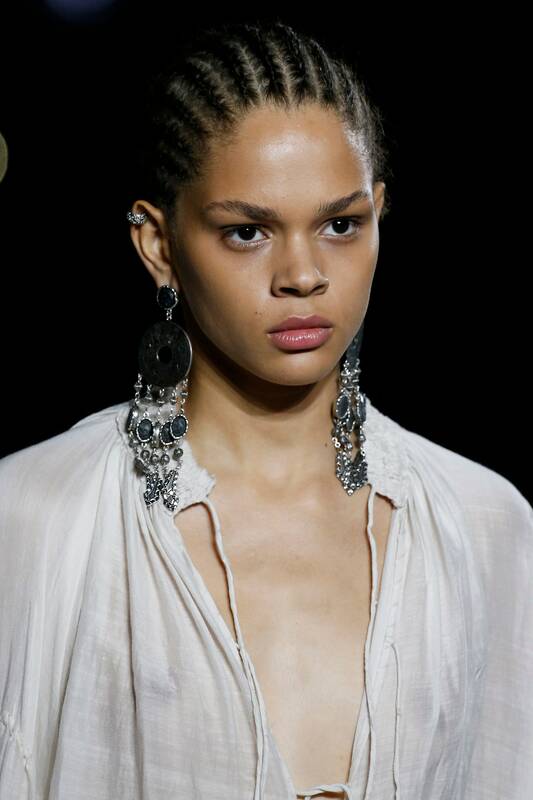 This model is wearing chandelier mesh earrings, which include fine chain hanging from a silver-toned loop. These earrings are so long they actually skirt the model's collarbone! We know what you’re thinking - where’s the color? 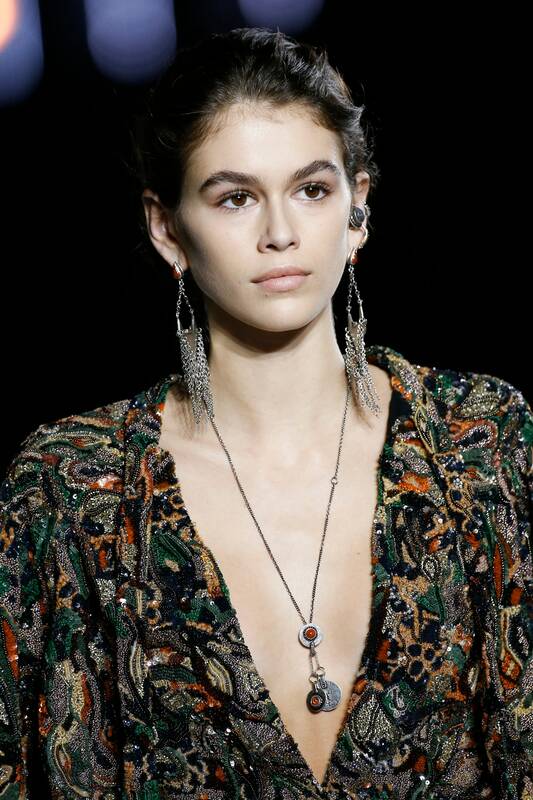 Of course, the Saint Laurent earrings feature small red stones, but you need more than that. The SUMARIS BLUE WORLD earrings are an excellent alternative. With these earrings, made of beautiful blue guitar picks, you still get that same chandelier shape, but with more color. Make sure you take a cue from the runway model and wear your hair up! You’ll want to show off these stunners. Did you know the most expensive pair of SUMARIS earrings currently in inventory is $200? We visited the Saint Laurent website the check the prices, and the least expensive pair is $395 - for tiny studs! 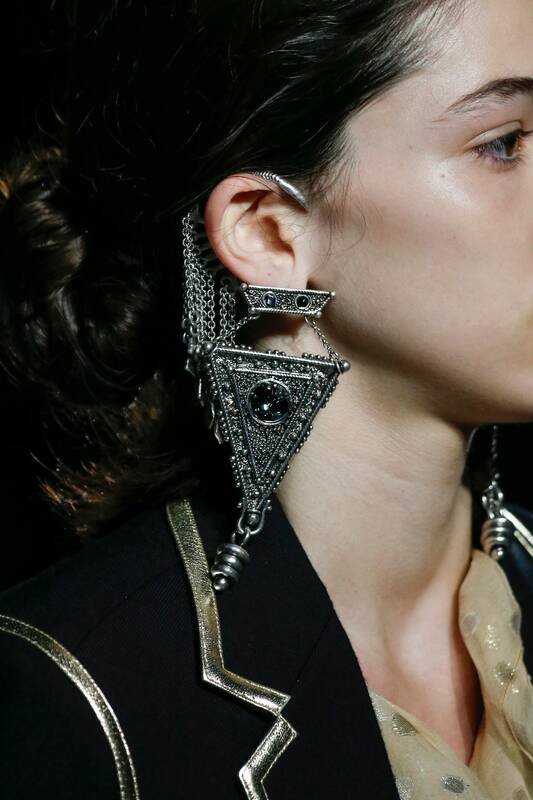 One pair of statement earrings is $1,195, and they're not even one of a kind. Do you have a pair of statement earrings in your wardrobe? If not, it’s time to prep for upcoming trends. Which is your favorite of the SUMARIS styles?